Serial Number: 001623. 40mm case size. 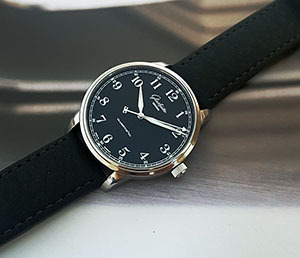 Stainless steel case with black leather strap. Black dial. Sapphire crystal glass. Automatic movement. Watch comes with Glashutte box and papers. 45mm case size. Stainless steel case with black rubber strap. Black dial Sapphire crystal glass. Chronometer. Chronograph function. Screw-down crown. Automatic movement Graham calibre G1710. Serial Number: 15819. 45 x 33mm case size. 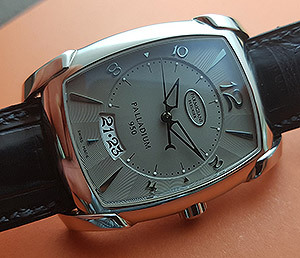 Palladium case with original Hermes PF leather strap and palladium deployment clasp. Slate dial. Date function. Sapphire crystal glass. Automatic movement. Limited edition Number 8 of 10 pieces only. Serial number: 322. 48mm case size. 18K rose gold case with rubber strap. Black dial with luminous hands and hour markers. Unidirectional rotating ceramic bezel. Sapphire crystal glass. Date display. Deployment clasp. Automatic movement. Hublot calibre HUB21 movement. Water resistant to 300m. 18k solid white gold case and bracelet. 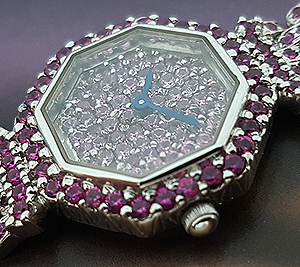 493 pink sapphires on bezel, dial and bracelet. 22mm case size. Movement manufactured by Grenchen, Switzerland, and set in the USA. Blue steel sword hands. Push/pull crown. Sapphire crystal glass. Quartz movement. Overall Condition: Appears to be unworn. 1 of only 5 made, locked in time. Worn a few times only. 45mm case size. Silver dial with silver tone hands. Arabic numerals and stick index silver tone bezel. 18K white gold case with black alligator leather strap. 18k white gold double folding clasp. Tourbillon. Moon Phase. Chronograph. Sapphire crystal glass and exhibition transparent caseback. El Primero 4034 automatic movement. Date function. Pull and push crown. 55 hour power reserve. A tourbillon is the ultimate sign of craftsmanship; a mark of haute horology - the very art of watchmaking. A device fitted only in the very top range models of a brand, and its flagship pieces. In addition, the El Primero is also ′fitted′ with Moon phase indicator AND Sun phase. And, like no other watch we know of, the moon and sun dials are placed above each other - one rotating every 29 days while the other is revolving once every 24 hours. The hand-made, hand-decorated Guilloche dial is simply stunning: this 45mm case diameter watch is simply impressive in every detail. Watch comes with deluxe box and papers, down to email correspondence and verification by Zenith. Serial number: 6095239. From 1960′s. 34mm case size. 18K yellow gold case. 18K Milanese mesh bracelet with no signs of wear. 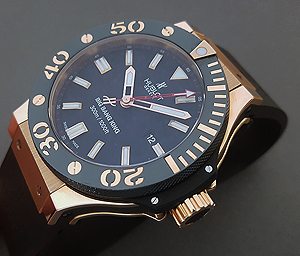 Gold dial with gold and black hands and hour markers. Date function. Automatic calibre 1500k movement with 7-balls bearing rotor. Total weight of gold is 65 grams so the gold alone is worth over $2000 as metal content value. The watch has been freshly overhauled and would fit an 18.5-19cm wrist as is. A good jeweller can resize it, if required. 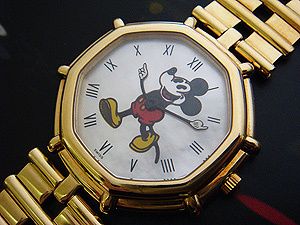 Gerald Genta ′Mickey Mouse′ 18K YG Ref. G28607, Serial number: 44690. 18K solid yellow gold case and bracelet, case size: 35mm. Gold bezel decorated with 8 gold bars. Mother of pearl dial with Roman numerals and a polychrome representation of Mickey Mouse indicating the time with his mobile arms. Sapphire crystal glass. Quartz movement. Total weight: 110g. Overall Condition: 9.5/10, very good. 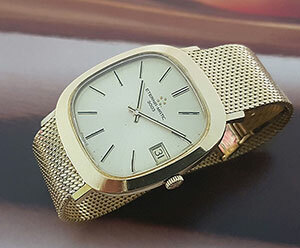 Swiss watchmaker Gerald Genta (born in 1931) designed watches for Geneva Universal and other Swiss brands. His best known models are Omega′s Constellation (1959); Patek Philippe′s Golden Ellipse (1968), Audemars Piguet′s Royal Oak (1970), IWC′s Ingenieur (1976); Patek Philippe′s Nautilus (1976); and Cartier′s Pasha de Cartier (1997). 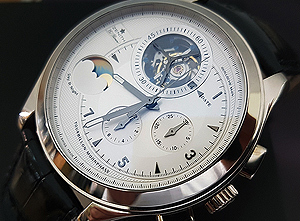 After starting his own brand in 1969, Genta would create the sonneries, among them the GÃ©rald Genta Octo Granda Sonnerie Tourbillion, which contained four gongs and an emulated Westminster Quarters bell ring at each quarter and on the hour, "the same melody rung out by London′s Big Ben", and priced at $810,200. 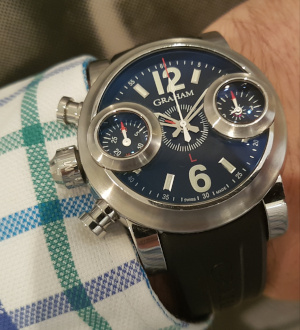 In 1994, he designed the Grande Sonnerie Retro, the world′s most complicated wristwatch, and priced at approximately $2 million. For private requests, Genta hand-designed the movements, dials and cases of his timepieces and employed limited or no external assistance, outsourcing or mechanization during the process; it was not unusual for a single watch to take up to 5 years to complete. During the 1980s, Genta obtained special licensing with The Walt Disney Company and distributed a limited edition of Disney character watches to the public; previously, they had been an unofficial private request by one of Genta′s repeat customers. The dials consisted of illustrations of Mickey Mouse, Minnie Mouse, Donald Duck, Scrooge and Goofy, with cases made of 18 carat gold. 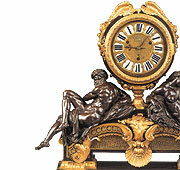 Designed in Le Brassus, Switzerland, the watches retailed between $3250â€“$3650 in 1988. Gerald Genta′s clients have included professional athletes, business executives, rock musicians, rappers, movie stars, politicians as well as royalty, including Prince Rainier of Monaco, King Hassan II of Morocco, King Juan Carlos and Queen Sofia of Spain, King Fahd of Saudi Arabia and Queen Elizabeth The Queen Mother of England. After his eponymous company was acquired by Bulgari in 1999, Genta resigned and created a new venture called Gerald Charles. As of 2010. Genta died in August 2011 at age 80.